A time to slow down, to reflect, to be grateful. A list of gratitudes, our gratefulness feeds one another. Joining the Gratitude Sunday Tradition at Wooly Moss Roots. Yes, today is Valentine’s Day. The pressure of romantic love and what our society commercializes us into believing about love is not my topic today because it makes me sad. One of the things I love most in this world is water. I might say water probably saved my life. Hwell, made it longer anyway. I love water for so many reasons, so I’ll share a few personal stories. Water helped break my addiction to Coca-Cola. I love Coke. As far as I’m concerned Coke is the nectar of the Gods. Let us disregard the non-nutritional high sugar or high fructose corn syrup, caffeine laden, phosphoric acid-cleans-up-blood-on-the-highway elements of this drink. No Diet Coke for this girl either, not when the artificial sweetener has proven to be a neuro-toxin that makes you crave more sweet. No. If I’m going to die, I want to die drinking real Coke, real sugar, all the caffeine. I’ve found a source from Mexico (there’s my carbon footprint) with real cane sugar in it as well, no high fructose corn syrup. I drink Coke. Ice cold. But not everyday, like I used to. I use it like medicine for headaches and upset stomach and for my weird body it works. Deliciously. Good thing I don’t have headaches and upset stomachs every day. I have digestive challenges; for lots of years, like since I was 19, something is always making me hurt inside. I discovered some literature about how the body uses water. This was in the day when I’d gone back to college and I was eating Tums all day long. Stress, too many responsibilities, too many commitments, too much pressure, and different eating habits went straight to my core with intestinal distress. After reading the studies about water, I began drinking the right amount of water for me. I soon stopped buying Tums, was able to change some food and exercise habits, and because I was well-hydrated I was also able to stop my daily habit of Cokes. Yay, it worked for me. Cool refreshing water, so adaptable to lemons and limes and cucumbers and any assortment of natural flavorings. I still love Coke. It has its place. But I drink water every day. I have city water, with chlorine and fluoride, and an inadequate filter and I don’t care. I won’t pay for bottled water in plastic bottles if I can help it when I already pay for tap water (my other carbon footprint). Maybe one of these days I’ll buy a nice expensive filter and get out all the chemicals the city puts into our clean water. I’m too lazy to gather the rain water we are given so abundantly in the Pacific Northwest, given the logistics of filtering, storage, and access. Imagine if somebody came up with an easy inexpensive way for individuals to process and store their own rain water on their own property. Of course your local municipality could no longer make money off you for what the sky gives freely but I think I’d still like to have access to (read: pay them for) the city sewer for waste water disposal as well as that’s another complicated system. Eliminating constant heartburn was a win for me. I’d had it so long I’d forgotten how nice it was without it. Drinking the right amount of water made the difference for me. That’s not to say I don’t still have intestinal distress; I’ve got lots of challenges in the gut. Let’s not go into the TMI realm. Water relieved my heartburn in a way no doctor or pharmaceutical or over the counter medicine had. So much for medical usage. I also love to be in water. I’ve been “between houses” (euphemistically: homeless) and getting a shower and into clean clothes was always the best thing ever. The. Best. Thing. Ever. I might not have known where I was going to sleep that night but at least my skin and scalp were clean and not creepy. When the son was small and in Cub Scouts being able to swim became important. Scouts have to pass a swim test before they are allowed to swim at camp. At my aquatic center classes are 30 minutes long with six students per class and it doesn’t take a math genius to figure out your kid gets five minutes of instruction, like the other five kids in his class. After three or four classes of the basics, I invested the class money on a swimsuit and got into the pool with him. I got over the fact I was fat, or if my legs were hairy, and I learned to go into the pool with my glasses on as I didn’t like being nearly blind in the water. The son’s confidence flew off the charts and he passed every Scout swim test. And I became addicted to the pool. That addiction was a good thing. I broke my left arm in July of 2007 and a once a week swim was part of my physical therapy. After my left arm healed my right arm went numb in January 2008. It was determined I had bone spurs on my vertebrae pressing on nerves. The doctors wanted to cut open my spine and trim the spurs. Surgery terrifies me and so many back surgeries leave one as bad or worse than before. I asked my doctor to support me in an exercise program. I began swimming three nights a week and walking a mile or two the days I didn’t swim. Within a month the numbness was relieved and I could feel my arm again. I cut down my swim sessions to once a week, continued walking, and the numbness only briefly returns on very rare occasions. In September 2014, something happened to my lower back. I do not remember a trigger incident which I understand is common. I began having extreme sciatica down both legs and my walking has been compromised ever since. I won’t go into detail about why I have no diagnosis, suffice it to say, there is none. I have absolutely no idea why I have the back pain, what is causing it, nor is there much relief in sight. I have had drug therapy (no help and yuck) and physical therapy (greater understanding and personally designed exercises). The pain is intermittent and I work through it, but I also use a cane now to keep me from falling over when the pain flash hits. The toughest part still is not being able to continue the daily walks I had become so accustomed to. My solution was going back to three nights a week in the pool. My goal is to keep as much range of motion as possible. The pool has helped. In the pool I can do movements I cannot do on land because of the weightlessness factor of water. It feels so good. An hour of aerobics in the water moving every muscle I can, and ten minutes in the hot tub is my idea of a little bit of heaven. After a long or hard day, I look forward to my time in the water more than I look forward to supper, jammies, and bed. To have that warm water embracing me, enfolding me, uplifting me is as necessary as reading to me. Reading is like breathing to me so you get the picture. I learned in Chemistry 101 water is the universal solvent. Solvent is a wonderful word for a substance that will dissolve another chemically different substance. So, for example, water won’t dissolve water because they are chemically alike, but water will dissolve the sticky strawberry soda pop somebody spilled on the table and left for you to clean up. Water is the least abrasive cleaner, if something is dirty try plain pure water first, then add soap or detergent chemicals only if needed. What would our planet be like if we had no water? I do not want to imagine. Plenty of authors have depicted dry worlds, and those stories are hard for me to read. Green plants that bloom colorful blossoms, grand leafy trees providing shade, savory vegetables and sweet fruits to nourish your body, great pools of water to immerse yourself in exist because of water and rain. Water for animals who soothe us and feed us, water to cool us and clean us, water to hydrate our bodies and power equipment. Like Aphrodite our world is born of sea foam. And what an elegant system, where water evaporates and returns to the earth via rain, where water runs from mountain to ocean feeding everything along the way, where water can be harvested and used purposefully. I love the feel of rain on my skin. Do we have 20 names for rain? Fog feels different than mist feels different from drizzle. O water, lovely water, how many ways can I say I love thee? What do you love this Valentine’s Day? There’s always a hot tub date with your loved one/s. Color Watch – colorful attractions in my neighborhoods this week – late winter is springing ahead. 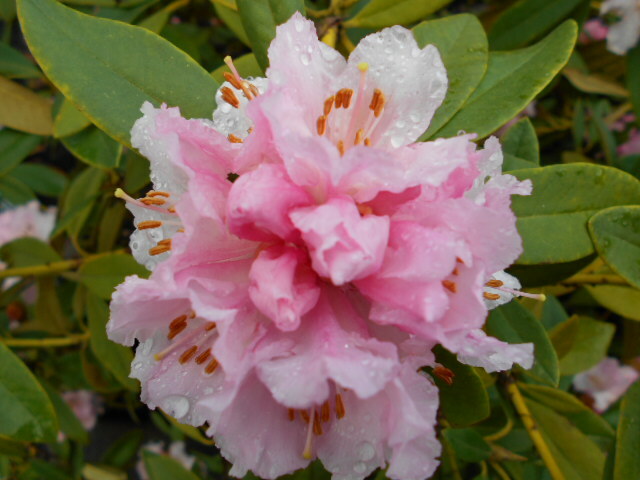 Pale pink rhododendrons. 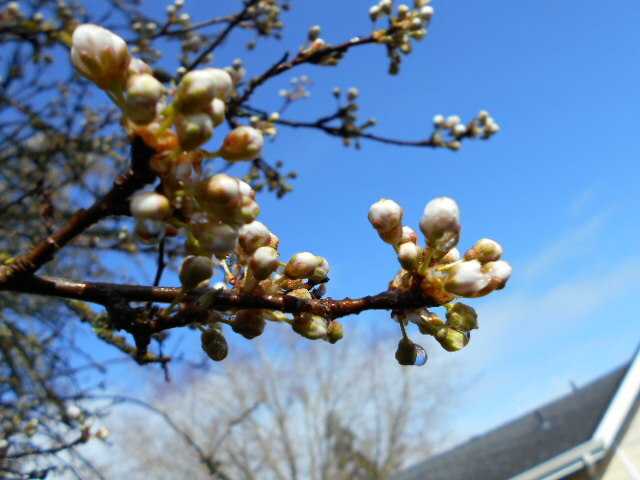 Fattening creamy white plum blossoms. 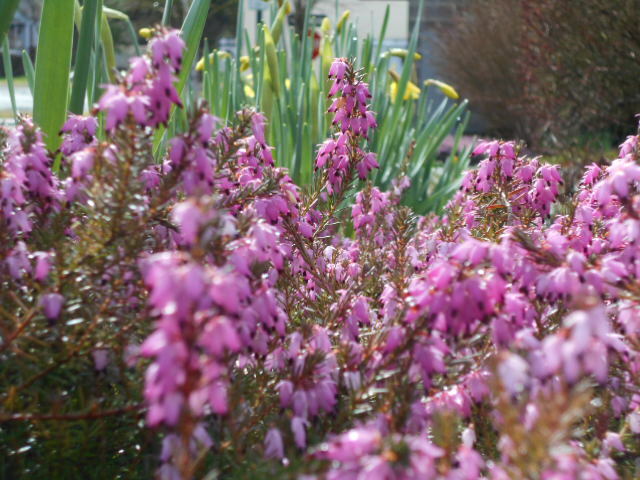 Darkening lavender heather with bulging daffodil buds promising next week’s blossoms. Current View – Midnight in Paris (2011, rated PG-13) with Owen Wilson and though I usually find this actor vacuous I enjoyed this fantasy romantic comedy. Wilson plays a writer vacationing in Paris with his fiancée and her parents, and at the stroke of midnight he finds himself transported to the 1920s ex-pat art scene amidst the company of Ernest Hemingway, Pablo Picasso, and Gertrude Stein (played by Kathy Bates). Worth your time. Finished The United States of Tara, a Showtime TV series from 2009-2011 about a woman, played by Toni Collette, who is dealing with dissociative identity disorder and how her family attempts to support her. BiZARRE. Anytime I need to feel better about my beautiful wacky family I can just watch this. Season 2 of Arrow is playing on my screen this week as well. Like reading comic books this is escapism fantasy for me. Cop Car (2015, rated R) with Kevin Bacon, two runaway 10 year old boys find an abandoned cop car and figure out how to steal it, except the car has a body in the trunk and isn’t abandoned. When cop Kevin Bacon tries to get his car back the adventure only gets wilder. Currently Reading – Entertained myself with a quick little trivia book The Book of Useless Information (2006, trivia), by Noah Botham and The Useless Information Society. Good thing I jumped to the last page early on. The last line of the book states “apparently 97 percent of all statistics are made up.” Now I know to check any fact I found in the book before I quote it. So far in my fact checking some of the “facts” in the book are right and some wrong. I’ll check everything. All in a Word: 100 Delightful Excursions into the Uses and Abuses of Words (2010, English language) by Vivian Cook. Just started, it has word tests and games, oh goody! Brian Jones: The Making of The Rolling Stones (2014, biography) by Paul Trynka. Genius so often destroys itself and is so easily abused by others. Yes, concurrently. The sound of rain as it pounds on the earth outside my window. The colors of gray rain skies are. The almost unbearably intense green of water drenched mosses, ferns, and grasses. White clouds reflected in gray brown mud puddles. Drizzle raindrops piling up on my hair. A solid roof to keep the rain outside where it belongs. Electrical appliances that clean my dishes and clothing with water while I do other housework. Watching clouds of steam wafting out the bathroom window after my hot shower. How nice my kitchen floor looks after it’s been washed with hot water and lemon juice. The real luxury of indoor water at your fingertips and temperature preference. Dry farming research at Oregon State University, and how watermelons are juicier and sweeter when given less water. If true, it leaves more water to use elsewhere. My wedding anniversary today and celebrating 41 years with the hubster and his particular bag of water human shape. Hoping you have a lovely week. This entry was posted in abundance, Aging, Education, Entertainment, Exercise, Food, GRATITUDE, Grief, Health, Homemaking, Medicine, Nature, Nutrition, Parenting, Photography, Poetry, Science, Technology and tagged abundance, aging, blessings, chlorine, clean water, Coca-Cola, drinking water, exercise, family, fat, flowers, fluoride, gratefulness, gratitude, grief, grieving, haiku, health, heartburn, intestinal distress, learning, mental health, mothers, nature, non-violence, nutrition, over the counter drugs, parenting, peace, pharmaceutical drugs, plants, poetry, rain, reading, swimming, swimming pools, water, water aerobics, writing. Bookmark the permalink.